Israeli Couscous also known as Pearl Couscous is a great alternative to rice, pasta and potatoes. Pearl Couscous, also known as Israeli couscous are small balls of toasted semolina flour. In Israeli they are called Ptitim. Use pearl couscous as a bed for stewed meat and/or roasted vegetables. Add pearl couscous to soups, salads and pilafs for a new twist on old classics. Like rice, couscous will absorb the flavors of whatever spices or sauce you are are using. 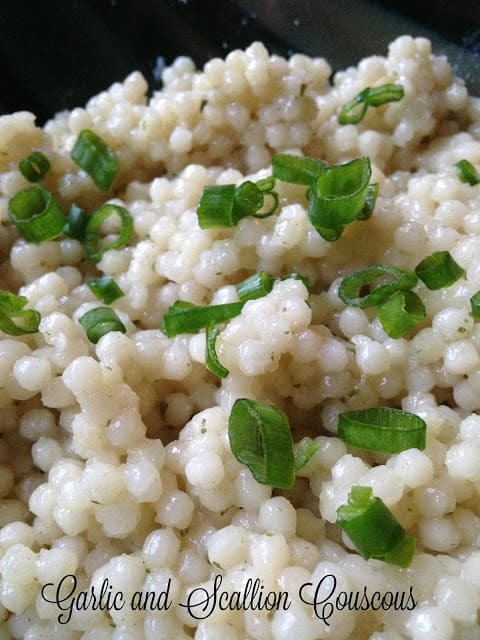 Using pearl couscous is quick and easy. Main dishes and salads are just minutes away. 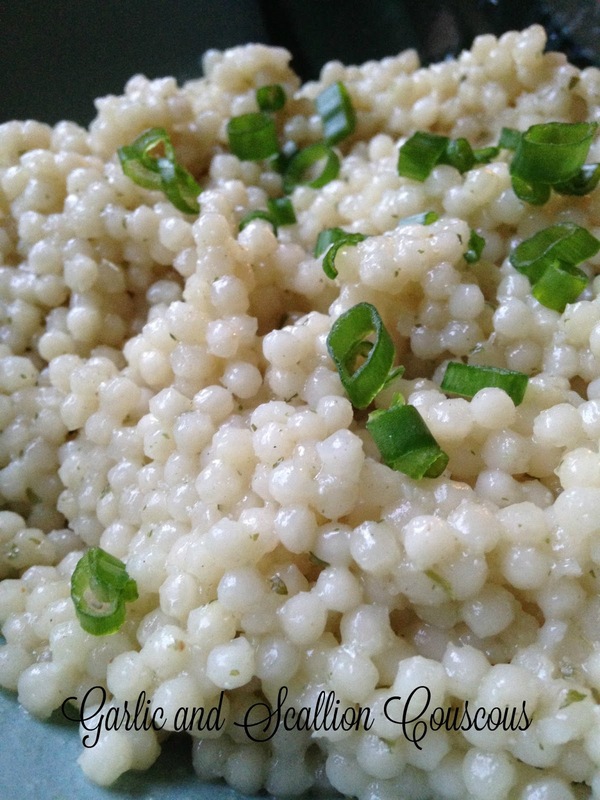 Garlic and Scallion Israeli Couscous is a great way to showcase pearl couscous. Couscous [KOOS-koos] A staple of North African culture, couscous is granular semolina. Cooked, it may be served with milk as porridge, with a dressing as a salad or sweetened and mixed with fruits for dessert. Packaged pre-cooked couscous is available in Middle Eastern markets and large supermarkets. The name couscous also refers to the famous Maghreb dish in which semolina or cracked wheat is steamed in the perforated top part of a special pot called a couscoussière, while chucks of meat, usually lamb or chicken, various vegetables, chickpeas and raisins simmer in the bottom part. In lieu of a couscoussière, a colander set over a large pot will do. The cooked couscous is heaped onto a platter, with the meats and vegetables placed on top. All diners use chunks of bread to scoop the couscous from the central platter. Couscous varies from country to country, Moroccans include saffron, Algerians like to add tomatoes and Tunisians spice theirs up with the hot-pepper-based Harissa. Harissa [hah-REE-suh] From Tunisia, this fiery-hot sauce is usually made with hot chiles, garlic, cumin, coriander, caraway and olive oil. It’s the traditional accompaniment for couscous but is also used to flavor soups, stews and other dishes. Harissa can be found in cans and jars in Middle Eastern markets. Bring the water/stock to boil; add couscous, cook for 10 to 15 minutes or until al dente, drain. Meanwhile heat oil, garlic and scallion tops over medium low heat, 3 to 4 minutes, and garlic starts to turn light brown and fragrant. 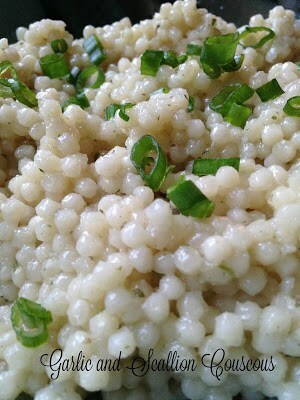 Stir in cooked couscous and lemon juice; season with salt and pepper. Transfer to a serving bowl, garnish with scallions.